“Yes, my lord,” Smythe said while taking the earl’s hat and coat. Between fussing over her dogs, Ebony and Cinders, and taking off her bonnet and coat, Kate hadn’t heard what their butler related to her father, but the last words were clear. Immediately upon entering the front hall she noted Smythe stepping close to Lord Beaufort and speaking softly. Kate’s curiosity mingled with her delight of returning to Quantock Hall. Visiting the Primrose’s for Yuletide had been enjoyable, but Kate felt happy to be home. “Katelyn, a word,” Earl Beaufort said while stepping into the west hall. He led her to the front parlour. “Mrs. Crozier passed away,” he informed her solemnly. “How?” A tremble went through her body, from scalp to toes. “Did she have relations?” I didn’t know much about her. Kate found she no longer had a voice. She kissed her father’s cheek, then slipped from his arm, walked silently to her rooms, and found Isabel unpacking, Miss Nestor helping. “Yes. My father told me,” she confirmed, and drifted into her bedroom. “I’m not…” she slouched on the pillows in a window seat. I don’t know what to say. Miss Nestor edged over and peered into her eyes. Kate held out an arm. The governess quickly stooped to her embrace. Kate wept a bit, pondering about Mrs. Crozier and how it felt to die. I didn’t get to know her. She was so distant and hard. But, I still cared for her, and she was such an excellent teacher. What else would she have taught me? Kate eased out of the hug, stood, then deployed a handkerchief and composed herself. “What will happen?” Miss Nestor asked. Kate was elated by Miss Nestor’s determined statement, and embraced the tiny woman again. Upon hearing the word dog, Ebony stepped between them wagging her tail, looking up. “Absolutely!” Kate crouched and fondled her pet. “Misty will have to wait until tomorrow, but this travelling suit is fine for a walk.” She stepped into her dressing room and took up a fur-lined cape, hat and muff. Meandering around the front yard, the browns of winter turning orange with the declining sun, Kate gazed out at the Exmoor hills. We’re quite small, compared to the earth and sky. Do we leave much behind when we die? She stayed on the gravel, avoiding the mud, watching Ebony run around the bushes and empty flower beds. Mrs. Crozier said I could be a great woman. I’m not certain what she meant, and now I’ll never know. At the lane Kate peered through the bare trees and picked out the red and grey patchwork of Maddie’s cottage. Kate marched through the woods, her breath puffing out great clouds of steam, the leaves crunching underfoot. At the gate she heard someone whistling Oranges & Lemons. Pixie, erstwhile London costermonger and now scullery maid, appeared from the side of the cottage hauling buckets. The girl halted with a jump, splashing water from the buckets, the tune cut short. Ebony dashed around with tail wagging. “Middling.” Kate made use of a word she had heard often while in the north of England, but then wondered if Pixie would know or fathom the meaning. “Travelling can be quite tiresome.” She opened the cottage door and held it wide so Pixie could enter with her load. “Where’s Maddie?” Kate glanced around the interior of the home, the plain but highly polished wood furniture glowing in the fire and candle light. “At Kingswood Farm. There is sickness there.” Pixie’s high vacuous tones took on a hint of warning. “Why are you here?” Kate sat in the settle by the hearth. 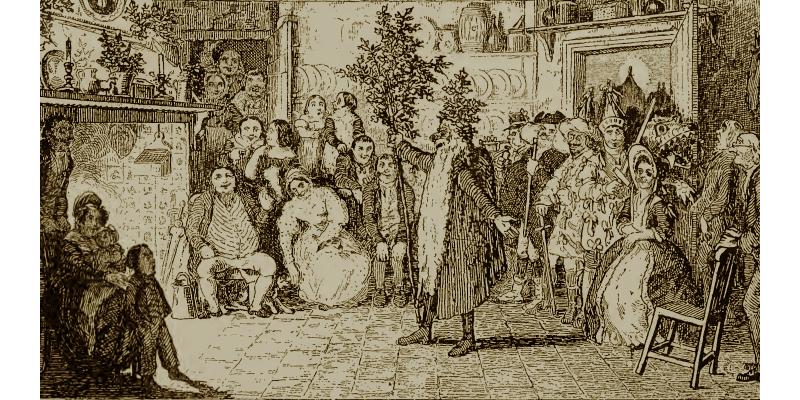 A folk tradition, mummers performing at Christmastide was always a delight and popular throughout the Victorian era. “You should wear it whilst you’re out.” Is there an old coat of mine she could use? Pixie stowed her mittens, added wood to the fire, poured water from the buckets into a cauldron, then made busy at a table scraping and chopping various tubers. “These are marsh mallow roots. I’m decocting them.” Pixie pointed out one of the pots by the fire with her paring knife. Kate considered the girl for a moment, happy to see her at work with an air of confidence. Would Pixie be the village wise woman some day? She briefly wondered if Maddie had been summoned when Mrs. Crozier took ill, but then remembered the women died in her sleep. “I’ve only a moment ago learned of Mrs. Crozier’s passing. A post-mortem photo of a corpse on display, possibly for a wake, late Victorian. “I don’t suppose you knew Mrs. Crozier.” Kate remembered the woman had cruelly referred to Pixie as an idiot and imbecile many times. “Indeed?” Kate felt genuinely surprised. Pixie’s wide-eyed visage grew more puzzled. She swept from the cottage, securing the door once her black retriever dashed by, then they wandered through the forest. The recently deceased lingered within Kate’s mind. Mrs. Crozier said I have the potential to be a great woman. What is a great woman? Boadicea or Joan of Arc? I’ll never be a warrior. Sappho or Mrs. Browning? I’m certainly not a poet. I don’t believe she thought I should merely have children for a great man. I’m sure she felt I could do important work… but what? Strolling back toward the manor, Kate looked up at one of the gargoyles. Perhaps share my future husband’s interests? Charity? She focused past the statue to the windows and noticed her maid and governess watching. Kate gave them a little wave. I’ve still got a lot to learn. At least I know I can ask Isabel about men. Stepping to the door, turning to the last rays of light, she tarried a moment longer. I’m fourteen years old next week. There has been a great deal of change since my last birthday, and there is still so much yet to come. It’s like Father said about death, I must face it and carry on. Hopefully, it will only get better.